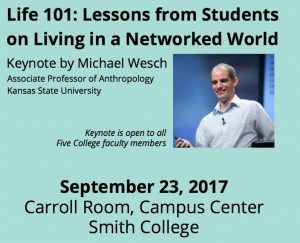 Michael Wesch is an associate professor of cultural anthropology at Kansas State University. Wesch’s work also includes media ecology and the emerging field of digital ethnography, where he studies the effect of new media on human interaction. His talk at 10 a.m. on Saturday the 23rd is open to all faculty in the Five Colleges. Congratulations to the faculty and staff who have received funding through the Five Colleges to develop new courses that use blended approaches – incorporating digital materials and tools into their courses. Michele Hardesty and Alana Kumbier, Lili Kim, Jennifer Bajorek and Karen Koehler, and Uditi Sen. The funds come from two consortial grants – one from the Mellon Foundation and the other from the Teagle Foundation. You can read about the programs here. Michele Hardesty (Humanities, Arts, and Cultural Studies, Hampshire College): Beyond the Riot: Zines in Archives and Digital Space will use online, classroom and site-specific learning to engage students with zines as primary sources for exploring feminist, queer, and POC cultural production in the 1990s. As the title suggests, these explorations will include, but go beyond, the well-known history of Riot Grrrl. With a blend of data visualization, digital annotation, DIY videogame creation, and physical zinemaking, students will create transformative means of researching zines and engaging with the contexts of their production. This course will be headquartered at Hampshire and taught by Dr. Michele Hardesty and Dr. Alana Kumbier, but will include multiple sessions and collaborators at other sites. This course will be offered to all Five College students in Fall 2016. Lili Kim (Critical Social Inquiry, Hampshire College): The goal of this project is to utilize technology and digital resources to deeply engage students in conducting transnational historical research through identifying, investigating, and interpreting primary source materials that span across time, languages, and continents to produce histories of Koreans in the United States. The emphasis and incorporation of blended learning work will allow students to access a growing number of important digital archives on Korean American history and U.S. history, and to help overcome the logistical stumbling block of not being able to travel to the archives to conduct research. Using selected online tools, this blended learning course will enhance opportunities and access for students to work collaboratively and individually on organizing and analyzing primary sources as well as synthesizing scholarship in the field. Students will ultimately help fill in the gaps in and further our understanding of Korean American history through their collaborative research projects, which will be available and archived online. Jennifer Bajorek and Karen Koehler (Humanities, Arts and Cultural Studies, Hampshire College): Reading Photography will take an innovative approach to teaching the history of photography by integrating the design and creation of online course modules, organized around selected photographs, with a slow teaching approach. The digital modules will be designed to increase student engagement, enhance opportunities for collaboration, and deepen the knowledge­base and resources that students will draw on in their assessed work. By allowing students to cultivate knowledge of historical context outside of class, the modules will actively enlist students in advance preparation, thus freeing up class time and allowing us to focus, during in­-class interactions, on the development of mindfulness and critical concentration in looking at, and reading, photographs. Additional outcomes will include skills development in research methods, practice using digital tools to create and research image collections, and the sharing of the online modules to enhance public knowledge. Uditi Sen (Critical Social Inquiry, Hampshire College): This project seeks to develop a blended learning curriculum that enables students to engage analytically and creatively with the memories of refugees in India and Pakistan. These are Hindu and Muslim refugees who often witnessed, and fled from, genocidal ethnic violence that accompanied the partition of British India into India and Pakistan. Their reminiscences, preserved as audio and video files in several online archives and blogs, offer a unique perspective, ‘from below’, of the partition of India, which is arguably the most formative event in South Asian History. They also encourage students to explore broad questions of universal relevance: how do refugees negotiate displacement? What impact does violence and trauma have upon identities? How does memory and identity interact in the telling of life stories? Oral history testimonies have often been describes as the ‘voices of the past’. However, since these testimonies are collected from refugees who not only inhabited a different time, but also a different place and culture, learning to ‘hear’ this voices is a challenge that requires not just careful study, but also creativity, analytical dexterity and empathy. It is here that traditional face to face learning in a classroom falls short of achieving the desired connection between the recorded, often disembodied voice, and the student who is set the task of hearing, analysing and understanding the narrative, in its full complexity. This project aims to develop a hybrid curriculum, entitled Refugees, Memory and History: Hearing and Interpreting Partition Voices, which blends together face to face or readings and lecture-based pedagogy with online resources and learning. The chief goals achieves by this project will be to overcome student hesitation in creatively engaging with voices from a foreign context, to ensure collaborative learning while students work on their independent projects and to create a course website that maps the learning process and showcases the work of students. The key texts of this course, the interviews, are available in online archives. This project will also blend classroom teaching, that includes lecture, small group discussions and workshops, with online learning using wordcloud, voicethread and blogposts. 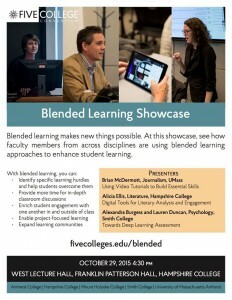 The deadline for proposals for the Five College Blended Learning Program is January 31st, which will be here soon. Any faculty interested in submitting a proposal will need to meet with Asha Kinney in IT to discuss the project before submitting the proposal. If you are considering this program please get in touch soon! 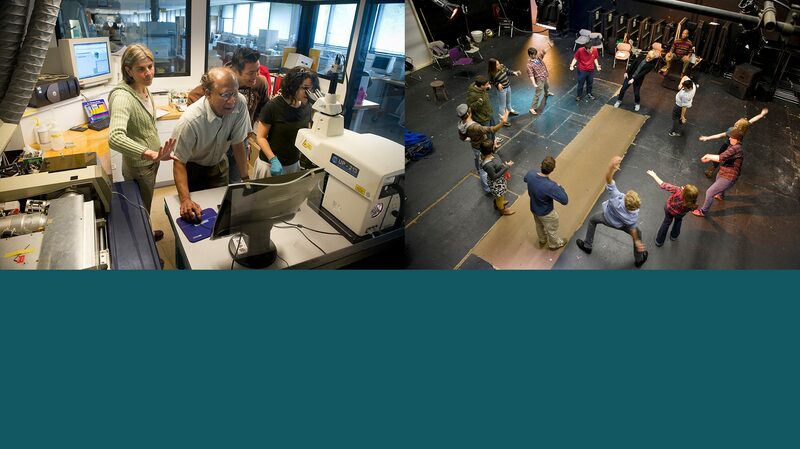 A listing of grant recipients and their projects can be found on the Blended Learning Program website, and we encourage any interested faculty to peruse this information in order to get a better idea of what kinds of projects this program tends to fund. Alicia Ellis of HACU received a grant for her class Writing from the Diaspora: Readings in Contemporary Women’s Fiction, which ran this past fall. Professor Ellis used various digital tools that encouraged student engagement with the material and close reading of class texts. She has kindly shared information about the project’s process and tools here. 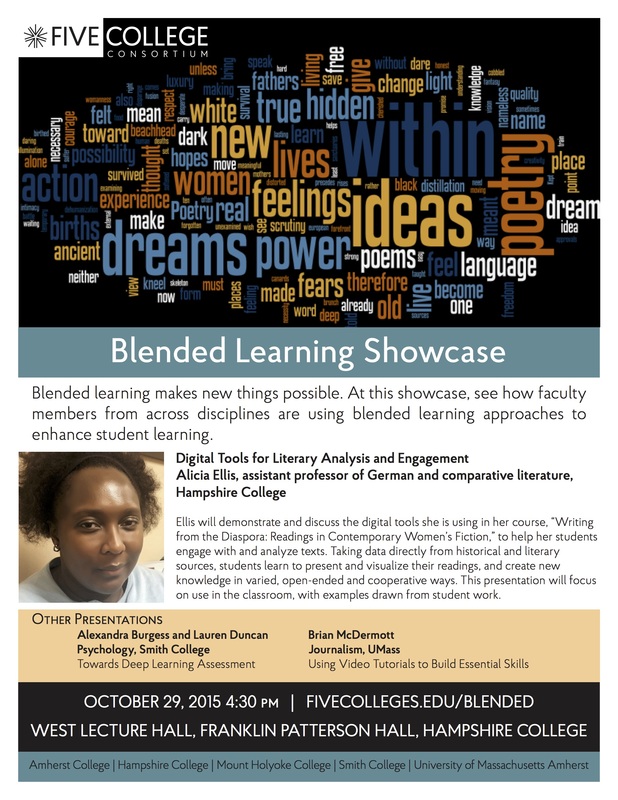 You can also see a video of her presentation at last fall’s Blended Learning Showcase in which she discusses the project (Hampshire login required for video).The other grant recipient under this program is James Miller of CS, who will teach a class this spring called Media in Cars. This class will focus on using digital technology, online collaboration, and project-based learning to explore the past, present, and future of media in cars. There is a website with details about the class and the tools it will use here. Another good resource for faculty interested in incorporating technology into their teaching, whether for a Blended Program proposal or not, is this video of a panel discussion about technology for teaching, learning, and collaboration from last spring’s Celebration of Teaching at Hampshire. Interested? Have questions? Get in touch! 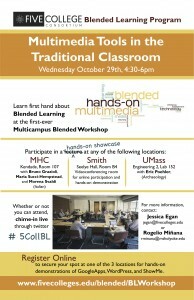 Come hear how faculty across the Five Colleges are using blended learning in their teaching practices. Presenters include our own Alicia Ellis! 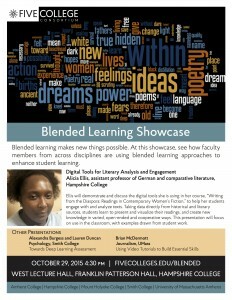 Visit the Five College Digital Humanities Newsletter for upcoming events and resources. 5CollDH Newsletter: Raffle winner, Fox Harrell talk, & more! Call for participation (.doc) in a faculty seminar next year (2015-2016) as part of the Five College/Mellon Bridging Grant in the Public Humanities. Are you using archives, museum collections, or other kinds of public humanities resources in your teaching–either current or proposed courses? If so, join this keenly interdisciplinary group of scholars who are doing the same. This is open to all tenured, tenure track, and contract employees with on-going appointments. Participating Fellows receive a stipend of $2000 for joining us for eight sessions over the next academic year. The Sixth International Digital Storytelling Conference is happening September 25-27 in the Five College area! The theme is Voices and Change: Activism, Education & Public Service. Please tell your colleagues and friends about this historic conference, the first of its kind on American soil!The website for the conference is live at www.dst2015.org. The conference is hosted by Smith College, with plenary events happening at UMass, Mount Holyoke College and other venues in the Five College area. The Call for Papers is now open through March 31, 2015. For questions, please email Yvonne Mendez at yvomendez@gmail.com. Look for more info in the coming weeks! 2. Teagle Foundation: 2-3 projects per year, approximately $15,000-25,000 per grant for one year, for a blended course in any area by a team of faculty members from at least two different Five College institutions. For more information and application materials, go to https://www.fivecolleges.edu/blended, or contact Rogelio Miñana, Faculty Director of the Five College Blended Learning Program (rminana@mtholyoke.edu) and Nate Therien, Five College Director of Academic Programs (ntherien@fivecollege.edu). 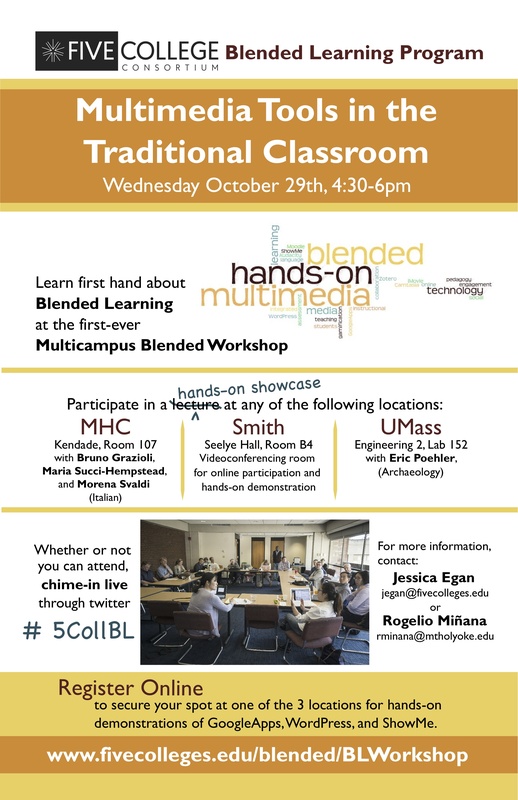 5C Blended Learning Workshop – October 29th, 4:30-6:00 p.m. Whether or not you can attend, chime-in live through twitter # 5CollBL.